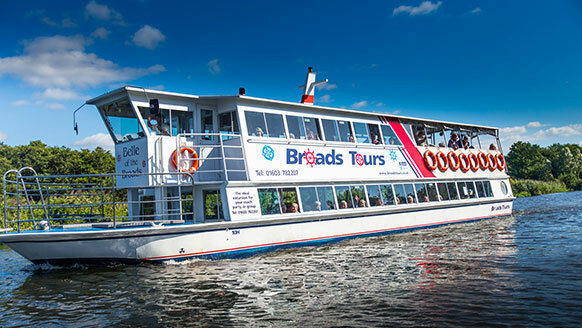 Enjoy a guided tour of the Norfolk Broads with Broads Tours. 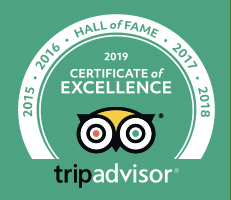 Looking for a Unique Venue for Your Celebration? 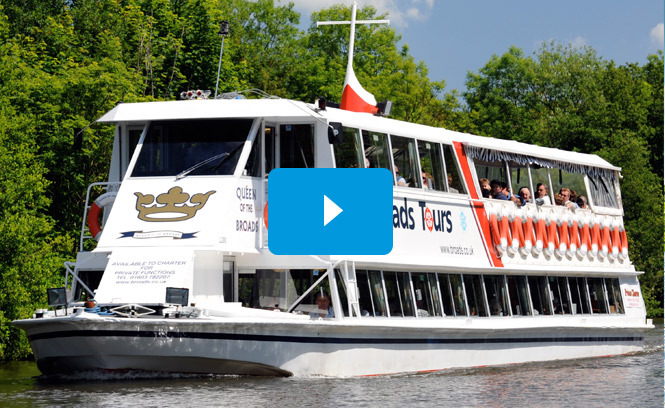 Why not charter your own Broads Tours passenger boat? Looking to explore the Norfolk Broads? Choose a Broads Tours river trip, sit back and do it in style with entertaining live commentary, light refreshments and licensed bar. Or pack a picnic, hire one of our day boats and enjoy the freedom of doing your own thing. Either way, we are sure it will leave you wanting to do it all over again! 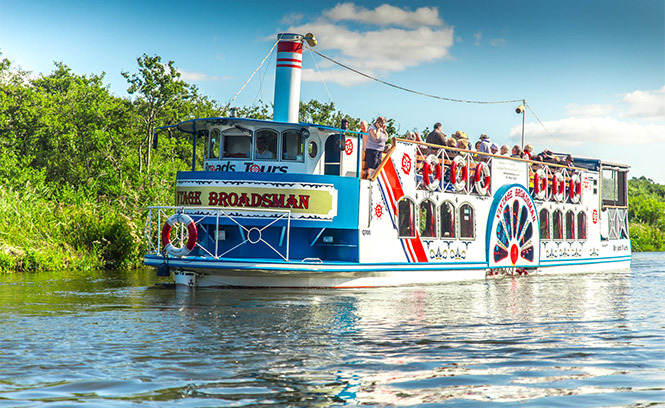 Wroxham is the perfect location for a boat trip, there’s plenty to see and do before and after your river trip, and it’s ideally located to continue your travels around the beautiful county of Norfolk. 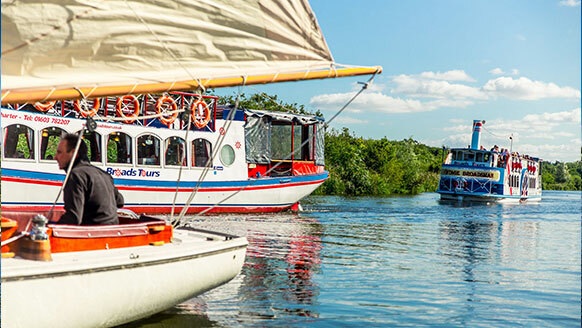 Enjoy the Broads … Britain’s magical waterland. 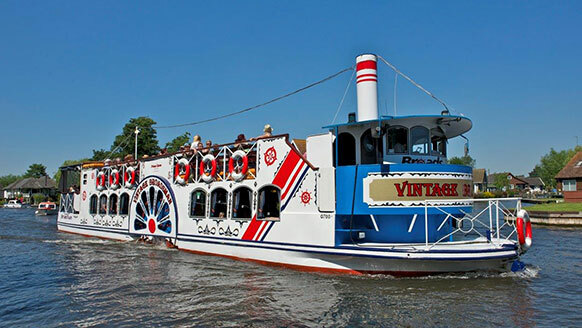 Explore the broads at your own pace, with flexible boat hire, from our base in Wroxham. With boat and time options to suit all. Would You Like a Longer Stay on the Broads? 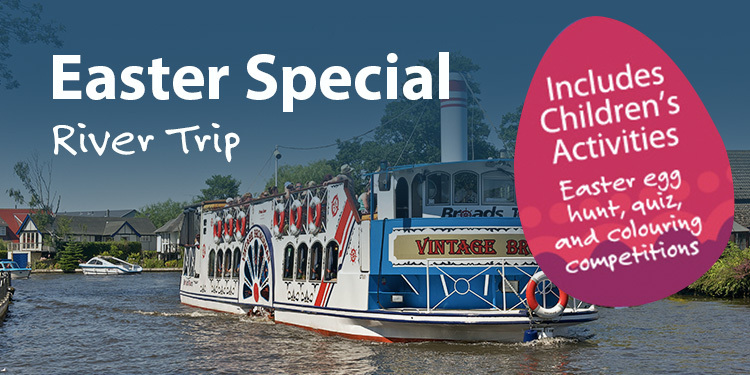 Our sister company Norfolk Broads Direct offer a selection of beautiful holiday cruisers and waterside cottages, visit their website to book your next break. We went on this trip as part of a holiday, the boat we went on was Queen of the Broads. The duration of the trip was one and a half hours, travelling up the river to Wroxham Broad and onto another smaller broad. There was a very good full commentary including who owned some of the houses on the river bank and the history of the broads and the owners of them. The broads are part of a national park and has a lot of wild life including some rare birds. This boat tour is well worth while and not expensive for what it is. We took a 1.5 hour trip on the Queen of the Broads and it was brilliant! Friendly crew, comfortable seating (inside and out), toilets and refreshments. Beautiful scenary and a great commentary which ensured we missed nothing. Highly recommended for all ages. We hired a small boat for several hours and it was a lovely way to travel to see the gorgeous properties lining the waterways. Had a lovely few hours relaxing on a boat trip we were on an Alfa day trip, and we went for a boat ride. What a lovely way to spend a few hours. We had commentary so we knew what was going on. It was so relaxing and on board you could get tea and cakes or a wine and sit there going along at 5 miles an hour, really nice. Brilliant! What a lovely team. From start to finish it went so smoothly. My husband and I had an amazing time. Refreshments available throughout the journey. Great commentary. Took some wonderful photos. Highly recommended.